Every day we report on a brand new connected device that hits the market, whether it's a smartphone, a tablet or a new computer, connected devices are infiltrating our lives at a super rapid pace. IDC doesn't see that slowing down anytime soon, either. The research firm said on Wednesday that connected device shipments will increase by 14% each year through 2016. The company said smartphones and tablets will be largely responsible for that growth. In total, there were 267.3 million tablet, smartphone and PC units shipped during the second quarter of this year, up 27.4% over the same quarter last year and up 2.8 percent from the first quarter of this year. That picture doesn't necessarily reflect shipments in the United States, however. 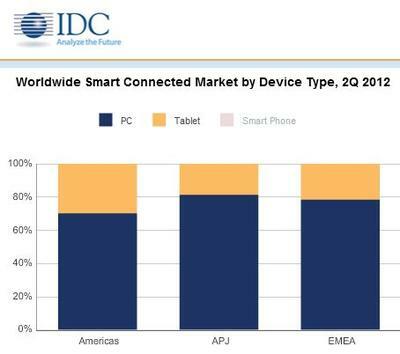 "In the U.S. market, it's clear that not only PCs but smart connected devices as a whole are facing a difficult time as both unit shipments and revenues declined on both a year-over-year and a quarter-over-quarter basis," IDC said in its report. "Unit shipments for 2Q12 fell 7.8% sequentially and 5% annually to just under 47.4 million units. Revenues for the combined categories slipped to $24.8 billion, a 10.3% sequential and 8.6% annual drop. The incredibly fast ramp for tablets and smartphones in the U.S. has clearly started to slow as overall macroeconomic conditions and a degree of saturation have begun to impact the market." IDC still sees the potential for massive global growth, however, because it argues that we've entered a new era where consumers carry more than just one connected device. Carriers know that too; that's why Verizon and AT&T have introduced new shared data plans that can be used across multiple connected electronics. "The recent shipment data clearly demonstrates that we have fully entered into the multi-device era, where individuals are buying and using multiple devices per person, most often with different combinations of operating systems," IDC program vice president for clients and displays Bob O'Donnell said. "The implications of this development on application developers, device makers, Web service providers, businesses, and even individuals is profound." IDC said it expects smart device shipments to hit 1.2 billion units this year, up 27.4% from last year. It suggests that figure will increase to 1.4 billion device shipments next year and that shipments will surpass 2 billion units by 2016.